OnePlus 5T spy app is our most popular and most complete tool for monitoring OnePlus 5Tcell phones. This advanced app can be used to monitor as many phones as you want. It allows you to listen to voice calls, see all incoming and outgoing text messages, read Viber, WhatsApp, Facebook and Skype messages and determine the position of the monitored phone via GPS at any time. 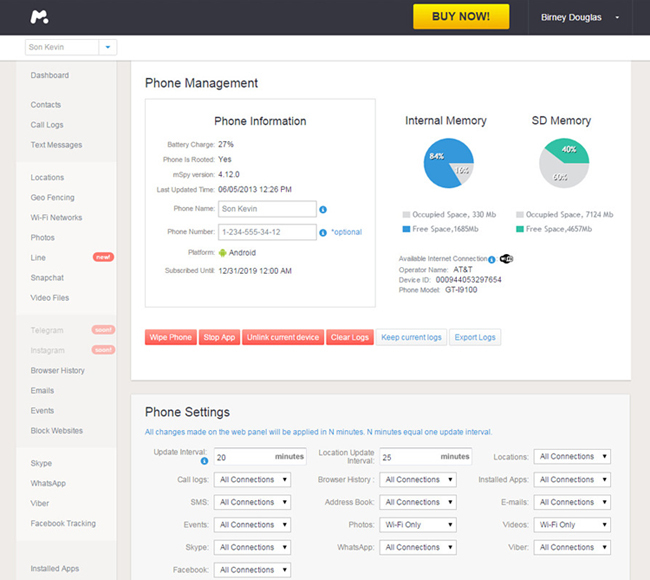 You can also record all calls and listen to surroundings. The price for this software package is of only $29.99. What this OnePlus 5T Spy App can do for you? All four different OnePlus mobile spy software suites available for download are compatible with the OnePlus 5T. Turning to design, the OnePlus 5T is essentially the same as its predecessor, but still recognizably new. The new 6-inch screen occupies a much larger amount of the front of the device, which is a welcome change for 2017. If you haven’t held a OnePlus 5 or OnePlus 5T before, I really suggest you do. The 5T retains the ultra-slim and polished chassis of the OnePlus 5 as well as the 3,300 mAh battery that fared well in the OnePlus 5. The OnePlus 5T is using a 6″ 1080p Optic AMOLED panel from Samsung with a Diamond Pentile arrangement, and I have had very few problems with it. In case you’re in need of a reminder, the OnePlus 5T is packing a Qualcomm Snapdragon 835, 6/8 GB of RAM, and 64/128 GB of storage. OnePlus 5T Spy Software is dedicated to those interested only in monitoring OnePlus 5T text messages. This monitoring app can be used to spy all incoming and outgoing text messages of a given Android smartphone. It also allows you to see all phonebook entries as well as intercept any text messages you do no want to be received by the phone owner. The price for this software package is of only $29.99. Furthermore you will be able to view all the files stored on the monitored device. Our software dedicated to monitoring OnePlus 5T voice calls. This advanced software allows the user to listen, as well as record and listen at a later time all incoming and outgoing voice calls of the monitored OnePlus 5T. When the monitored device is not on a call, you will also be able to listen to the surroundings. The price for this software package is of only $29.99. Access to the phonebook is also granted as well as the capability to modify it. Follow the precise location of your child’s phone with the OnePlus 5T GPS tracker. Set safe zones and get immediate notifications whenever your child enters or exits them. Determine route history and most frequently visited locations. Browse thumbnails of every photo and video sent or received on your child’s phone. Whether it is sent via a chat app, SMS or email. Prevent sexting and other inappropriate photo sharing with OnePlus 5T Spy Software.